Everyone is familiar with the conventions of the Hollywood film narrative. This isn’t a reason not to study Hollywood – or to take the conventions for granted. Hollywood, as befits the dominant institution in cinema across the world, is highly dynamic and constantly evolving in terms of film narrative. However, it is often difficult to analyse the films you know best. It helps to have some ‘distance’ from the films we study and one way to do this is to study some films that are ‘not Hollywood’ in order to make comparisons. Often by ‘comparing and contrasting’ similar films from different systems we notice much more about them than if we looked at only one system. Hero is a film that is recognisable as a traditional Chinese genre, first from literature and then from cinema. 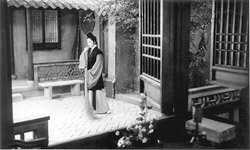 The wu xia pian or ‘martial chivalry film’ has gone through several cycles of popularity in the cinemas of the ‘three Chinas’ (‘mainland China’, Hong Kong and Taiwan) since the early 1950s. 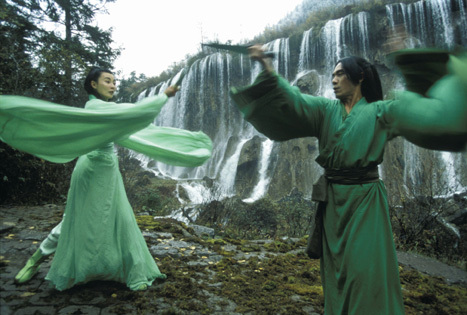 The genre has been affected by events outside China, not least the worldwide success of Crouching Tiger, Hidden Dragon (US/China/Taiwan/Hong Kong 2000). The director of Crouching Tiger was Ang Lee, a Chinese-American who made the film as a tribute to the films he had enjoyed as a child in Taiwan. Hero could not have been made on the scale (i.e. with the budget) that is apparent on screen without the success of Crouching Tiger. Although Hero has a Chinese director, Zhang Yimou, he is known in the West for his ‘art films’, most of which have been melodramas – not ‘action films’ in the Western sense. The four big stars of Hero are divided into two who are widely known for ‘non-action’ roles in Hong Kong Cinema (Tony Leung and Maggie Cheung) and two genuine martial arts stars who have moved from Hong Kong to Hollywood (Jet Li and Donnie Yen). Because of these ‘global considerations’ and the backgrounds of the individuals concerned, Hero could not be a straight ‘martial chivalry’ picture – and this means it will have found different audiences, who will have ‘read’ the film in different ways. Hero uses the narrative device known as a ‘flashback’. The film starts in the present (a ‘present’ 2,200 years ago) and then Nameless begins to tell his story, allowing narrative time to be ‘re-wound’. But there is a twist since it becomes apparent that Nameless may not be a reliable narrator. He is prompted by the King to remember things differently, so that we experience some of the same events twice with different outcomes as the stories are re-told. Towards the end of the film, the narrative returns to the present and in this final sequence we experience events in parallel – what is happening to Nameless in the palace and what is happening to Broken Sword and Flying Snow in the mountains. This kind of narrative structure is not unique, although it is unusual. It fits a genre set in a ‘pre-industrial society’ where there are no cameras or audio recorders, no ‘evidence’ of what happened. It is part of an ‘oral tradition’ where people tell stories and within a wu xia it works because one aspect of a duel between warriors is ‘sizing up’ an opponent. Defeating an enemy is not all about action. It also involves psychology and out-thinking an enemy. Interestingly, one of the most famous films that used a similar structure was Rashômon (Japan 1950) – a film which director Zhang has referred to as an influence. Rashômon is set in 12th century Japan where a man is murdered and his wife raped. The accused is allowed to tell his story, which is very different from the wife’s. Then he changes his story and a witness gives a fourth version. The film raises the question “what is truth”. In Hero we get at least three different narrators. Nameless begins the story, but is then interrupted by the King and later by Broken Sword, both of whom recount their own experiences which Nameless would not necessarily know. The different versions of events in Hero refer to an assassination plot (and a great romance) but the film does seem to end with a ‘resolution’. Nameless dies a hero’s death and Flying Snow dies with Broken Sword dead in her arms. China is eventually unified. But is this the end of the ‘story’? Because of the history of the writer-director and the nature of the wu xia genre, what do we take away from the story? Are we confident that the second version of events is more truthful than the first? The writer-director of Hero, Zhang Yimou, trained as a cinematographer in the Beijing Film School and emerged in the early 1980s as one of the ‘Fifth Generation’ of Chinese filmmakers. Several of the filmmakers from this period became famous around the world as their films received screenings overseas and won prizes at festivals. In the late 1980s China emerged from a long period of isolation from the rest of the world and many of the films seen in the West were interpreted as saying something about the history of China under Mao Zedong in the 1950s to 1970s – not directly, but by means of metaphor. 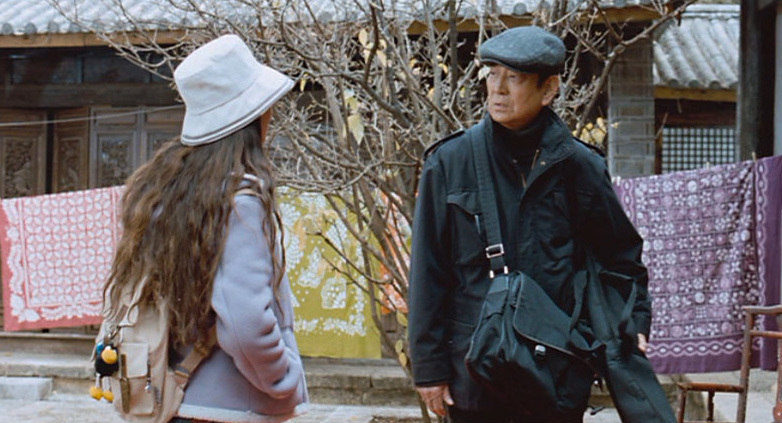 Zhang Yimou began as a cinematographer and then moved on to become a director. He quickly established a reputation as a director with enormous visual flair and in particular, the use of colour. At the beginning of his directing career he made three ‘period melodramas’, Red Sorghum (1987), Ju Dou (1990) and Raise the Red Lantern (1991). Ju Dou was set in a dye-works and you can probably work out from the other two titles that ‘red’ figures strongly in these films. All the films are very carefully ‘composed’ and controlled, so that each image is almost like an art photograph. At the centre of each image is a very beautiful woman, played in each case by Gong Li. In his last few films, Zhang has used his new protégé, Zhang Ziyi, who in Hero plays Moon. A cinematographer who rivals Zhang Yimou for visual style in East Asian cinema is Chris Doyle. Although Australian by birth, Doyle settled in Hong Kong to learn his trade and became associated with the films of Wong Kar-Wai. Through this connection, he, like Tony Leung and Maggie Cheung, gained a profile in the West. Doyle has been a very ‘experimental’ cinematographer pushing forward the boundaries of what can be achieved on film. The combination of Zhang and Doyle was bound to be special in some way. Complementing the two is Tan Dun, the composer of the score for Crouching Tiger, but generally not a prolific composer for cinema, being known in China and internationally for his symphonic work for the concert hall. The score uses traditional instruments and chants, but is also carefully mixed with sound effects, e.g. in the fight between Nameless and Sky, the sound of rain, the clatter of the blind musician’s stick, the clash of metal when sword meets spear etc. White is the final colour, dominating the deaths of Flying Snow and Broken Sword and alternating with the black sequences back in the palace. Maggie Cheung and Tony Leung in the green sequence. IW: How did you come up with the color changes in the film: red, white, blue and green? ZY: Hero is not a traditional martial arts movie. It’s very structurally presented. I like Rashômon, and thought I could use different colors to represent different parts in the movie. IW: Why those particular colors, red, white and blue? ZY: There’s no particular meaning to each color. I just needed the colors to represent . . .
Zhang suggests that there is no relationship between the particular colour and what happens in the sequence. Perhaps we should be suspicious of any director who makes this kind of statement (he could be ‘playing’ with the interviewer, or perhaps he was just bored). Even if Zhang did not consciously choose a colour, we as the audience will respond to colours differently. Red is most often associated with ‘passion’ and ‘danger’. This is true in every society – red is the colour of blood. It has a further meaning in China where it could be a reference to the victory of communism. Blue is often a cold colour associated with water, whereas green is often associated with calm. White is slightly problematic since in some cultures it relates to purity and in others to death. White is the colour of mourning clothes in many parts of Asia. If you want some more ideas about what the possible meanings of the colours might be, a detailed discussion is available on this website: www.spcnet.tv/movie/hero/movie_hero.shtml This review raises many interesting points about the mise en scène of Hero. Author R. Hu suggests that it bears all the signs of Zhang Yimou’s approach to mise en scène: “the use of water, blood red colours, pigments, drapes/fabric, aerial shots and box-like architectures”. The King of Qin’s version of the story which is shown in blue and has a strong circular motif (think of the circle of library scrolls within which Nameless performs the trick with the cup). This is repeated but with a subtly altered mise en scène in the white sequences. The circle represents the king’s view of strength and unity and blue is suggested as the colour of imagination (this is how the king would like the story to have unfolded?). A great deal seems to hang on the ‘excess’ of water and the contrasting drought in the desert scenes. How many times does water seem to be important? When Broken Sword first meets Flying Snow it is by a waterfall, when Nameless fights Sky it is teeming with rain. When are the other times that water is featured? The reactions of audiences towards the film in the West (it is more difficult to assess what they might be in China) often contrast what they perceive as a technically brilliant film with a rather disturbing political message. The ‘hero’ is a man who sacrifices himself to allow the King of Qin to unify the warring states and establish the Chinese Empire. This does not go down well in the West and many commentators have criticised Zhang Yimou who in the past has been both praised and damned for the assumed political messages of his films (equally, but in the opposite way, in Beijing and Washington). Much of the debate hinges on the final text that appears on the screen. In the Miramax version in the West it says ‘Our Land’, but Chinese scholars have suggested that the Chinese script actually means ‘under heaven’ or ‘the world’. Is the act of sacrifice that Nameless makes for ‘Chinese’ people or for all people? It might be helpful to consider the importance of all the emphasis on the calligraphy and the symbol of the sword in the film. This importance comes from Broken Sword. Who is the real ‘hero’ of the film? Is it Nameless who certainly seems to be the main protagonist? Is it the King of Qin who creates the Empire of China? Or is it Broken Sword, from whom the whole idea of sacrificing oneself for the ‘greater good’ comes? It might be worth exploring what you think is the purpose of the love story between Broken Sword and Flying Snow and how this relates to the resolution of the film’s narrative. If we want to understand the complexity and depth of the filmic narrative, it is essential that we know something about the genre elements in the film and what these might mean in terms of the expectations of the audience. Hero has been described as a ‘wu xia pian’. Mandarin and English are different kinds of language and therefore translations are open to interpretations. We will work with a translation that suggests ‘martial arts chivalry film’. Such films are not well-known in the West with only Crouching Tiger, Hidden Dragon and Zhang’s follow-up film to Hero, House of Flying Daggers (2004) getting any kind of wide release. Western audiences are aware, however, of more contemporary martial arts films from Hong Kong, such as those of Bruce Lee in the 1970s and Jackie Chan in more recent times. Also, many audiences are familiar with the choreography of martial arts as it has been imported into Hollywood action films – everything from The Matrix trilogy to the Charlie’s Angels films. the repertoire of these films will share certain elements with similar genres in other cultures, e.g. the chanbara or ‘swordfight’ film from Japan and the ‘swashbuckler’/musketeers/knights tales from Europe and America. There could also be links to westerns and gangster films – those in which a notion of honour, loyalty and responsibility are important. related to these super powers, wu xia may also involve other fantasy elements including witchcraft, ghosts, out of body experiences etc. the mission may focus on some form of lost sacred object, often a scroll, a sword etc. the tradition of female warriors is not new and can be traced back to 1920s cinema in China (see Reynaud 2003). The modern female warrior possibly dates from an important Taiwanese film directed by King Hu, A Touch of Zen (1971). Looking through this list of elements it is clear that Hero does use several elements from the repertoire. the focus on calligraphy is strong and Broken Sword’s mission to bring swordsmanship and brushwork together is a driving force in the narrative. However, as the filmmakers have indicated, Hero is not a ‘pure’ or traditional wu xia. There are other elements that are important. The romance between Broken Sword and Flying Snow is essential to an understanding of the narrative. The questioning of the love of one for the other, the ‘tests’ of love, the anger and jealousy at suspected betrayal etc. are all elements from the love story. (Even if the jealousy was not ‘true’, it still features as an element.) These elements don’t invalidate an approach to the film as wu xia, instead they make it a richer and more complex text because they are essential in any reading of the narrative. The explication of basic concepts in genre offered in this pack is extended in the resources pack on Key Concepts: Genre published by BFI Education Projects and itp publications in 2001. 1. How is the art of calligraphy represented in the film? Which of the characters is most associated with calligraphy and what is it that they do? 2. What is the role of the character Moon in the film’s narrative? What does she do and how significant is her role? 3. How strong is the love between Flying Snow and Broken Sword – how is this love represented? 4. How would you describe the ‘quest’ or ‘mission’ that drives the narrative of Hero? 5. List the main sequences in Hero according to the dominant colours (of costume, decor etc.). How would you explain the difference between the red, blue and green sequences? 6. How many of the ‘genre elements’ of wu xia have you seen being used in Hollywood films? Select one or two examples and explain how the same elements might be shared by Chinese cinema and Hollywood – and how they might be used differently. 7. How would you describe the King of Qin? Is he a sympathetic character or is he a villain? What kinds of evidence do you take into account in your decision? 8. There are several fight scenes in the film. How does the director attempt to make each fight different so that we don’t become bored? 9. How is sound used in the film? Are there moments you remember when a particular sound or passage of music is essential to understanding what is happening? Or does sound always simply support the image? 10. Why do you think water plays such an important part in several of the fight scenes? Mr Takata and translator Jasmine. Back to the DVD bargain bin again for another Chinese film not released theatrically in the UK. This time it’s Zhang Yimou’s 2005 film made between House of Flying Daggers and The Curse of the Golden Flower. Ironically, I watched this low-key film just a few days before Zhang Yimou stunned an enormous TV audience with his Olympic Games opening ceremony. My take on Zhang Yimou is that he has proved to be adept at three different kinds of directorial activity: the expressionist melodrama (e.g. the ‘Red’ trilogy, including Raise the Red Lantern, the action spectacular and the neo-realist drama. Riding Alone for Thousands of Miles falls into the third category. The film is built around the weighty star persona of the Japanese star Takakura Ken, often referred to as the ‘Clint Eastwood’ of Japanese Cinema. All the Chinese characters in the film are played by non-professional actors, as in Zhang’s earlier Not One Less (1999). Takakura Ken plays Mr. Takata, a Japanese man in his seventies living quietly in a fishing village and long estranged from his only son, Kenichi. When the son is hospitalised in Tokyo, his wife contacts the old man, who learns that his son’s wish is to return to China to film a folk opera ‘Riding Alone for Thousands of Miles’ in the Western Chinese village where he has spent several years of research. The father, realising that the son is seriously ill and that he wants to do something to bring about a reconciliation, determines to go to China and film the opera himself, despite being unable to speak the language. The trip is long and complicated and Mr Takata relies heavily on his translator Jasmine. A number of obstacles are thrown up, not least the temporary replacement of Jasmine by a local guide with only rudimentary Japanese. In the final part of the film, Mr Takata builds a relationship with a small boy who is himself the son of a father he hasn’t ever met (the man who is supposed to perform the central role in the opera). The film runs a number of risks, not least that it will become overly sentimental and that it will lead to a feelgood ending – the kind of resolution often expected of a Hollywood film featuring a revered old actor and a ‘cute’ child. But this isn’t a Hollywood film and though there is an emotional charge to the narrative, Takakura Ken and Zhang Yimou are too highly skilled to mess it up. They both work exceptionally well with the non-professional cast. Perhaps the Eastwood comparison is apt. Takakura Ken does very little, but has enormous presence, matched only by the jaw-droppingly beautiful cinematography in the mountains. The ending of the film is not contrived and audiences prepared to think about the narrative as well as engage with the emotion should find it very rewarding. The American reviews of the film are mixed. Some recognise its qualities and praise it highly, others find it ‘lightweight’. There are even some attempts to see the film as ‘propaganda’ for Chinese officialdom and the ‘happy lives’ of the village folk. It is of course a matter of taste, but I would argue that the film sits easily in the neo-realist tradition. The story is not contrived, the behaviour of characters makes sense in the situation and we learn something about human relationships – what’s not to like? From a wider perspective, the film does begin to explore the Sino-Japanese relationship at a time when there has been some tension over the representation of the war of 1937-45. Zhang himself was responsible for the popular film Red Sorghum in which the brutality of the Japanese offensive was portrayed. In Riding Alone, we see the icon of urban Japanese action films taken to the rural Chinese hinterland and the attempts between the two to communicate on a basic human level. Interestingly, rather than film the Japanese scenes himself, Zhang appears to have delegated this task to the veteran Japanese director Furuhata Yasuo (who has worked wih Takakura Ken on big commercial pictures). The Japanese scenes are cool and quiet and visually present a sharp contrast with those in the village/towns of Western China. The two are often linked by phone conversations and this was one aspect of the film that reminded me of earlier comparisons I’ve tried to make between Zhang’s neo-realist films and those of recent Iranian Cinema. There is a scene in Abbas Kiarostami’s The Wind Will Carry Us (Iran 1999) in which an engineer from Tehran, visiting a remote village, has to climb a hill to get a mobile signal. In Riding Alone, a group of villagers follows Mr Takata around the village and onto the rooftops in a search for a signal. (In fact, the more I think about it, the more similar the two films become – in the Iranian film, the busy engineer travels to the village where a relative is dying and during his stay learns something about himself through observing village life.) I’m impressed that you can get through to Chinese villages from Tokyo on a mobile phone – there are parts of rural Northern England where getting a signal is very difficult. The representation of Japanese technologies – phone, still camera, video camera and 4×4 vehicle – are very important in the story, but I was also reminded of recent Chinese films (e.g. the work of Jia Zhang-Ke, such as Unknown Pleasures, 2002) in which community music performances and local use of video technologies is key to the ‘New China’. Riding Alone was distributed in North America by Sony and promoted as a Zhang Yimou film. I think it would have sold reasonably well in UK cinemas. I’d certainly recommend it. The soldier is out of place in the village. 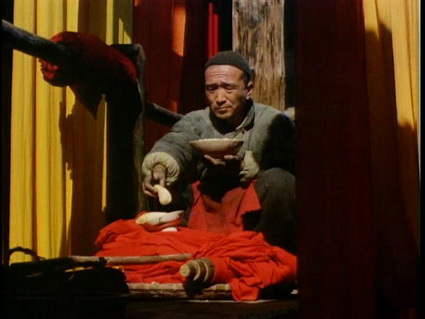 Yellow Earth was one of the most important films to appear in the 1980s, not just in China, but in the whole of global cinema. When it was released in the UK in 1986 it had an immediate impact and was recognised as one of the few films to be marked by a genuine attempt to create a ‘new’ kind of cinema. For the UK audience this was very much concerned with the cinematic qualities of the film – its use of colour, composition and framing and its use of sound to evoke an ‘unknown’ time and place. A similar response met Souleymane Cissé’s 1987 Malian film Yeelen which presented a different but related view of a sub-Saharan African culture. A further similarity between these two films is the background of their creative forces – filmmakers educated and trained in the context of European film culture, who then turn to their own traditional cultures to find stories to tell and an aesthetic through which to realise their vision. All the Western scholars referenced here are agreed on the importance of the ‘auterist vision’ adopted by the trio of Beijing Film Academy graduates, director Chen Kaige, cinematographer Zhang Yimou and production designer He Qun. Where previous creative teams thought to realise Chinese films using a conventional mode of representation developed from the 1930s through the 1950s (Stage Sisters being a good example of such an approach), the Fifth Generation filmmakers on Yellow Earth looked to the traditions of Chinese painting and folksongs for a suitable aesthetic to convey a story that was also ‘different’ in its concerns. Although taken from a novel, the ideas contained in Yellow Earth were thoroughly re-worked for a film produced by the young filmmakers from their base in Guangxi, far from Beijing in Southern China. They travelled north to shoot on location and drew on a range of specifically local influences. Yellow Earth is set in Northern China on the Loess Plateau of Shanbei in Shaanxi province, where the soil is the result of a wind-blown fine silt carried to the region from the plains of Central Asia. The landscape is constantly being sculpted by wind and water erosion, producing deep gorges. Not only is the earth yellow, but the area is also traversed by the Yellow River – one of the major river systems of China. Zhang Yimou was born in the region and he went to great lengths to represent it on film – shooting at particular times of day to capture the range of yellows, ochres and browns in the soil. Traditional painting styles used bold colours and Yellow Earth also includes what have now become the almost trademark vivid reds of Zhang Yimou – all the more startling against the austere backdrops. The framings frequently use the horizon line to comment on the importance to the characters of their environment. In a conventional landscape framing the horizon line might be place somewhere in the central third of the image, but Zhang pushes it further towards the top or bottom of the frame. Yellow Earth has a minimal story line. But, although little happens as such, there is narrative development through the lyrics of the songs. These are explored in some detail by Farquhar, who demonstrates that it is through the songs (and the singing) that the central discourse about bringing the ‘new’ (the Communist ideology) to the ‘old’ (the traditional life of the peasantry) is articulated. The re-writing of the lyrics of traditional songs was a major concern for the Party – ‘new wine in old bottles’, but, as Farquhar points out, the song collector misses the importance of the voice of the young woman. Farquhar’s 1992 analysis (also alluded to in her 1994 paper with Berry) explores what she calls the ‘hidden gender identity’ in the film. She suggests that the meaning of the film is hidden in its presentation of the people, the landscape and a minimal story. She uses the Taoist concepts of the yin and yang to foreground the story. The concepts do not relate directly to ‘men’ and ‘women’ but rather to gender principles which could be manifest in all things. Thus yin refers to the moon, the Earth, Autumn, Winter, darkness, water, femininity, death and stillness. Yang refers to sun, heaven, Spring, Summer, light, fire, masculinity, life, movement. Since the film begins with a memorable image of sky (yang) and earth (yin) and goes on to explore several other ‘elemental’ oppositions, it is clear that this approach to an analysis offers rich pickings. The location of the film has a further symbolic power as it represents both the mythic birthplace of the Chinese people and the base from which the Communists went forward, after the Long March in the 1930s, to eventually wrestle control of the whole country from the Japanese and the Nationalists. Uniquely, it represents the birth of ‘old’ and ‘new’ China. Farquhar recognises that the yin/yang approach offers only one reading of what is, as many audiences have discovered, a film which hides its meanings very carefully. But whatever approach we take to the film it is clear that it represented in 1984 a decisive break with the socialist realist tradition, not only in its aesthetics, but also in its lack of a clear central social message about the revolution. Indeed, it seems reasonably clear from the film that a central tenet of Maoist thought (and practice) is being challenged. Although the soldier and song-hunter Gu Qing is a sympathetic character with noble motives, he is too distanced by his own training to be able to understand the peasant world that he encounters and as a result he does not bring the promised transformation to the lives of Cuiqiao and her brother and father. In their different ways, many Fifth Generation films would later question how the ‘modernisation’ offered by Maoism could engage with the traditional lives of people also being subjected to the external pressures of globalisation and consumerism. Like Yellow Earth, some films would look at the earlier decades of the twentieth century for a ‘way’ in to this question. In doing so, filmmakers like Chen Kaige and Zhang Yimou would also have to withstand charges of ‘elitism’ from audiences, more used to ‘easy to understand’ narratives as well as attempts by the government to curtail activities that could be seen as critical of central policies – a tall order indeed. Chris Berry and Mary Ann Farquhar (1994) ‘An Analysis of Yellow Earth and Black Cannon Incident’ in Herlich and Desser (eds) op cit. Mary Ann Farquhar (1992) ‘The ‘hidden’ gender in Yellow Earth’ in Screen Vol 33 No 2. First chance this week to get to screenings in the China 07 season (10 years since the handover of Hong Kong). At Cornerhouse on Wednesday I watched Judou (dir. Zhang Yimou, China/Japan 1990) in the cinema for the first time since the early 90s. Somebody appears to have found the original UK 35mm print lurking in the ICA basement. The projectionist told me that it was ‘fragile’, but apart from the usual scratches at reel ends it played fine and the colours were just sensational. Judou is one of the most visually spectacular films I’ve ever seen and one that depends to a large extent on colour grading, especially the reds for which Zhang Yimou is famous. According to various sources, this was one of the last films to use the original Technicolor process. I don’t know if this is true, but it’s rare to see anything like Judou today. I’d skimmed through a VHS copy before the screening in order to prepare some notes for my introduction, but I sat and watched the film all through, mesmerised by its beauty and promising myself a Zhang Yimou feast. I’ve just bought some DVDs from YesAsia.com The Chinese DVDs of Red Sorghum and Shanghai Triad are terrible with poorly dubbed sound and awful colour (thankfully Apple’s DVD player lets me tweak the colour) — but they are very cheap. The ‘digitally remastered’ Hong Kong DVD of Raise the Red Lantern is excellent. It was intriguing to go back and watch one of the early collaborations between Zhang Yimou and Gong Li in the same week that The Curse of the Golden Flower opens in the UK. I’m looking forward to the opening, though I’m a little apprehensive after Gong Li was wasted in Miami Vice last summer. Today I joined Keith to watch The Arch (Dong fu ren) in Bradford. We both enjoyed the film, but were a little puzzled by the season’s notes (presumably written by Mark Cousins). 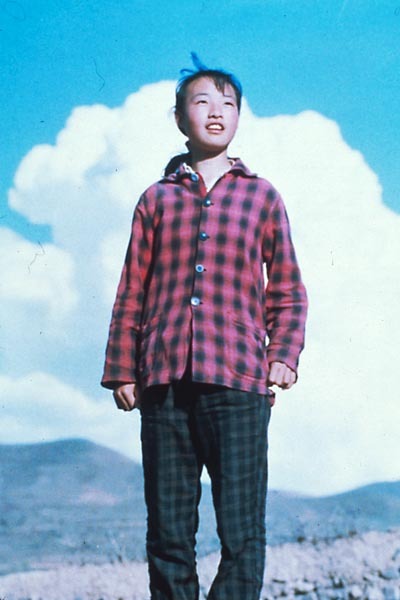 They tried to suggest that this was a film which heralded a new direction for Chinese Cinema in 1970 – essentially pre-dating the breakthrough of Yellow Earth in 1984 (or “pre-figuring the modernity that was to come”). I’m not sure about this. The Arch is certainly unusual and I’m not sure I’ve seen many films from Hong Kong/Taiwan of this vintage in order to make comparisons. The Hong Kong print we saw was in good condition and at first I thought it was going to be a fairly slow romance set in that indeterminate past (the notes say the Ming Dynasty) often featured in Hong Kong Cinema. 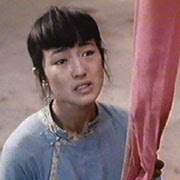 But as it got going it soon became evident that it was indeed a melodrama with a familiar central figure played by Lisa Lu (an actor with a long list of Hollywood credits), a woman who is driven to desperation by the rules of patriarchy which prevent her from having an emotional/sexual life in middle age (40!). Without reading the notes beforehand we both felt that this was a film with elements of Indian and Japanese cinema and possibly influences from further afield as well. A black and white melodrama in 1970 already feels slightly old-fashioned and the various devices that the notes suggest are ‘pre-figuring modernity’ are all more associated with 1950s and 60s cinema: freeze frames, use of soft focus/blur and what seemed like optical special effects that would not have been out of place in the 1920s. The production context of The Arch is difficult to research. (One of the other audience members told us that the dialogue was Mandarin. At least one of the web references I was able to follow claims it as Cantonese. My ear is not reliable and I don’t understand either language, but by the sound I would have guessed Cantonese.) It was written and directed by Cecile Tang (Shu Shuen) who, according to IMDB, was 29 when she made the film. She then made four more Hong Kong features in the 1970s. The film was produced independently and was apparently photographed by Subrata Mitra, famous as Satyajit Ray’s cinematographer in Bengal in the 1960s. This isn’t corroborated on IMDB but perhaps explains why some of the shots looked familiar. The editing is attributed to Les Blank, a well known American independent filmmaker with a string of credits as director, cinematographer and editor. Overall, the film appears to be a conventional melodrama presented in a hybrid style. It obviously depends on audiences, but I saw several shots (the departure of the daughter across a lake, for example) that could have come from Mizoguchi and the use of visual devices that reminded me of early Kurosawa. I don’t think the Yellow Earth connection is valid, but programming the film alongside Judou and Two Stage Sisters as part of the evolution of Chinese melodrama makes sense. The most influential ‘film movement’ in the history of the cinema was arguably the promotion of neo-realism in Italy during the 1940s. The model of filmmaking practice that emerged from a very specific set of circumstances in that turbulent period became the inspiration for a diverse range of celebrated directors from Satyajit Ray in Bengal and Sembène Ousmane in Senegal to Jean-Luc Godard and Francois Truffaut in Paris and Ken Loach in Britain. At a time when the average Hollywood film costs $50 million, it is heartening that the digital explorations of the Dogme 95 group offer something that recalls the freshness of neo-realism. But whilst those merry pranksters have arguably achieved as much through the brilliance of their marketing as through their films, it is even more heartening to see the recent release of two films that go right back to the ‘ur’ neo-realist model. Not One Less (China 1999) and The Wind Will Carry Us (Iran 1999). Very different in their tone and address, both gain from adherence to the fundamentals of neo-realism and offer teachers and students a way in to one of the important debates about cinema (and one specifically addressed in the UK by A Level Film Studies – FS5 World Cinema). Here are two of the tenets of neo-realism, the location-shooting and the use of non-actors (or actors suited to their roles). Renoir’s skill in terms of ‘outdoor’ shooting was next seen to marvellous effect in the sublime short feature Partie de campagne made in 1936. Renoir then turned away from this style, but one of his assistants was Luchino Visconti, who in 1942 produced his own first feature Ossessione, an adaptation of James M.Cain’s The Postman Always Rings Twice set in the Po delta region of North East Italy. The outdoor scenes strongly evoked Renoir’s style but the film was censored by the Fascist authorities and because of copyright problems surrounding the adaptation, the film was not seen in Britain until the 1970s. Now, however, it is regarded as the forerunner of the Italian neo-realism that developed after 1945. Visconti was one of the great names associated with this period, primarily for La terra trema (1947), an account of tuna fishermen in Sicily struggling to survive economic oppression and the terrors of the sea. • the plot was developed from a single everyday incident. A unemployed man is dismayed when the bicycle he uses to search for work is stolen. He sets out to find it with his son. This is the essence of the neo-realist approach, formulated into a ‘manifesto’ by the scriptwriter Cesare Zavattini, who described how it was possible to write a story beginning with a simple act. “A woman goes into a shop to buy a pair of shoes. They cost 7,000 lire.” From this Zavattini must create a two hour story – how? He simply asks, why does she need new shoes? How will she find the money? Does her husband know about the purchase? What else might she have spent the money on? Trying to write a story from this kind of opening premise is an excellent exercise for students. In de Sica’s case it tended to lead towards melodrama and perhaps a sentimental film. This isn’t a charge that could be levelled against Roberto Rossellini, who certainly used melodrama, but in the context of a much more hard-headed approach to social, political and philosophical questions. Roma, citta aperta made in 1945, not long after the Nazis departed, shocked the world with its depiction of the partisan struggles in the city and Paisa in 1946 went further in its use of non-actors and actual locations to detail the struggle throughout Italy. Rossellini became the philosopher-king of realist cinema. He became opposed to the idea of cinema as mere entertainment. He believed that scripts should not be constructed artificially, but that ideas should be “born in the film, from the subject”. Most of all, neo-realism should pose problems and make audiences think. Rossellini produced a body of work unique in cinema history and well worth exploring. His 1953 film Viaggio in Italia was written as it was filmed, incorporating local events into the story. This bewildered the Hollywood star George Sanders but inspired Jean-Luc Godard when he came to make films in the 1960s. An article by Laura Mulvey on Viaggia in Italia appears in the December 2000 issue of Sight and Sound. Jean Renoir was instrumental once more when he travelled to India in 1950 to make The River. Here he met the aspiring filmmaker and Bengali intellectual Satyajit Ray, who became an ardent supporter and effective pupil. Ray also made a trip to London where he saw several neo-realist films. When Ray eventually completed Pather Panchali in 1955 he introduced the possibility of film production in the developing world outside the commercial film industry. Ray had nothing to do with the ‘all India’ films from Bombay and his method once again turned to location shooting with non-actors and a story, although adapted from a classic Bengali novel, that detailed the lives of a single family in a rural village. Throughout the 1950s and 1960s, filmmakers from Africa, Asia and Latin America trained in Paris, Rome or Moscow and returned home to make first features in countries with little film industry infrastructure. Inevitably, the filmmaking model that attracted them was neo-realism, not only because it promised a low budget and the possibility of shooting without local support, but also because of its tradition of asking questions about social conditions – perhaps the overwhelming motivation for filmmakers in newly independent countries trying to come to terms with the end of colonialism and their hopes for the future. Realism has long been a contentious issue in Europe and North America and there isn’t space here to rehearse the whole debate, but simply to note that the most celebrated contemporary British director worldwide is still Ken Loach. Loach himself refers to his main influence as the Czech New Wave of the 1960s, but he also acknowledges a debt to neo-realism. He always appears to have difficulty releasing films in the UK, especially when they dare to address issues. At the time of writing the release in the UK of Loach’s latest film Bread and Roses, about the struggles of immigrant Mexican workers in Los Angeles, has been put back yet again. The suggestions are that it is “not very good”. Well, maybe it isn’t his best film (and I haven’t seen it) [I have seen it now and it is up to the usual high standard], but it’s fair to suggest that Loach working at 50% of effectiveness would be better than most features that are released in the UK. More to the point, this kind of response to politically engaged work helps to make it more difficult to get new films made and released. Interestingly, the film opened in France in November on 87 screens – far more than is likely in the UK. Loach’s current production, The Navigators, is about the effects of railway privatisation on a group of workers. Trade reports suggest that because of funding changes brought about by the Film Council, The Navigators will go straight to television without a cinema release in the UK (it will, of course, get a release in Europe where Loach is appreciated and where he has consistently found backers). Ironically, Loach and his crew were in the process of derailing a train as part of The Navigators shoot when the Hatfield crash on the GNER mainline caused four deaths, subsequently blamed on poor maintenance of the track. The political force of ‘realism’, as irritant to both left and right, is neatly illustrated by the release of Not One Less. One of two films released in the UK by Chinese director Zhang Yimou during 2000 (The Road Home is currently on release), Not One Less is an almost exemplary neo-realist film that could easily have been written by a Chinese Zavattini. In the mountains of Northern China (filmed in Western Hebei province) a teacher in a tiny village school needs to visit his dying mother. He makes an arrangement with the local mayor to leave the school and its twenty pupils in the care of a 13 year-old village girl, Wei Minzhi. The girl tries to teach the children local songs but her attempts are disrupted by the absence of a boy who has gone to the city to seek work. Minzhi knows that she won’t be paid her bonus (of a few pounds) if he does not return, and she turns school work into a project to raise the bus fare to take herself to the city, find the boy and bring him back. 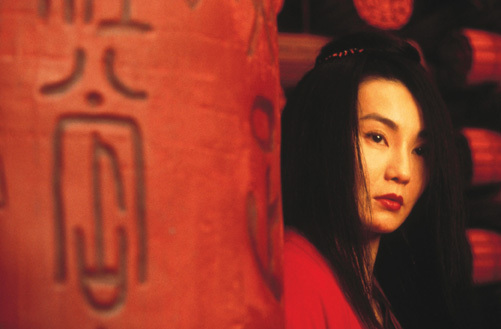 Zhang Yimou is in some ways an unlikely neo-realist, known in the UK for the sumptuous colours, breathtaking cinematography and glorious melodrama of films like Red Sorghum, Ju Dou and Raise the Red Lantern. He first came to notice as a cinematographer on Yellow Earth, directed by fellow ‘Fifth Generation’ film school graduate Chen Kaige in 1984. The so-called Fifth Generation were the first filmmakers to complete film school after the end of the ‘Cultural Revolution’ of the 1960s and 1970s. Their appearance at film festivals and on the world scene was dramatic – a cohort of fresh talent with high degrees of skill and wide knowledge of techniques from a traditionally strong film industry long in the doldrums. They were allowed to choose a much wider range of film subjects than had been possible since 1949, but they were still aware of the possibility of censorship and Zhang tended to select period pieces for his own directorial work. Then in 1992 he made The Story of Qiu Ju, a contemporary film in which a pregnant young woman in the countryside is so incensed by the failure of the local bureaucracy to deal with an attack upon her husband, that she travels to the city to gain redress. This was in many ways a neo-realist piece, shot, in a much less extravagant style than Zhang’s previous work, on location in the country and the city. But its leading player was Gong Li, who even with a freshly scrubbed face and peasant dress, remains one of the most beautiful women in the world and a genuine international star. In Not One Less, Zhang goes all the way with non-professionals. All the principals play themselves and the performance of Wei Minzhi, decidedly not ‘glamorous’, contributes greatly to the film’s emotional power. Beautifully shot and edited and with knockout performances, Not One Less shows what can be done with a simple narrative idea. Generally well-received, the film has also been criticised for its ending. Minzhi finds the boy after making a tear-filled announcement on television and the ‘community tv’ crew from the city station travel back to the village to record the homecoming. 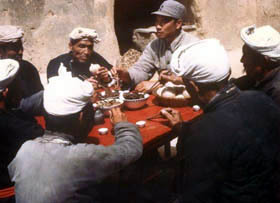 Critics suggested that Zhang, who has had numerous run-ins with the Chinese authorities over the years, had made the film to please the government – showing life on the streets as romantic rather than a national disgrace and covering up a social problem rather than exposing it. Exploring this view would be a good exercise for students. There is no doubt that the ending is somewhat sentimental, but it could be argued to be critical of the way the tv station uses Minzhi’s story. The film was supported by the Hollywood studio Sony Pictures and there are a number of interesting product placements (the tv gear is all Sony) including a moment when all the children clamour to spend some of their earnings on a can of coke. Is this a celebration of American junk culture or a critique of globalisation? Not One Less is highly recommended for study. There are several issues for anyone wanting to use films made by non-European/American film industries with young people. The first is simply a question of availability. Relatively few films from the ‘under-developed’ world are shown in the UK. Those that are will generally be taken to be examples of a form of ‘international art cinema’ – they were not made for a popular audience at home, but for an art audience around the world (or they are made for the home audience, but fail to get screened in competition with more commercial films from abroad). These films are ‘difficult’ for most audiences, simply because they do not conform to the conventions of popular entertainment cinema, either Hollywood, Hong Kong, Bombay Cinema etc. In the UK, such films generally play to older, more middle class audiences. Popular films from India, Hong Kong etc. are more likely to appeal to an audience of 15 year-olds, partly because cultural differences are to some extent compensated for by familiar action, and music sequences. Unfortunately many of the ‘action films’ which might actually raise interesting social questions, such as City of God, set in the favelas of Rio de Janeiro in the 1980s, are Cert. 18 or 15. So even though City of God would attract a lot of student interest, it isn’t appropriate. There are relatively few films rated U, PG or 12 available and appropriate. ‘Local’ implies films conceived and produced in the country by indigenous filmmakers. Some recent films have appeared to be local, but have actually been made by European filmmakers or by exiles working with European funding, i.e. The Story of the Weeping Camel (Germany/Mongolia 2003). This is not to criticise the film as such, simply to suggest that such films are made with a European audience in mind (see the opening para of this section). In other cases, especially in relation to recent ‘independent’ films in China, foreign production deals are the only means whereby filmmakers can explore ‘sensitive’ issues – e.g. Blind Shaft (China/Germany 2004), a film about the dangerous conditions and corruption in the Chinese mining industry. • Not One Less could be considered as a simple ‘quest narrative’. But what is different about the quest here compared to Hollywood? The article above was written in order to celebrate the release of two films, Not One Less and an Iranian film The Wind Will Carry Us (1999). This latter film is not appropriate for KS4 students, but many Iranian films are, partly because they are also ‘neo-realist’ in approach. A possible choice would be The Day I Became a Woman (Iran/France 2000, Cert U), directed by Marziyeh Meshkini, a member of the ‘Makhmalbaf Film House’ (she’s the second wife of Mohsen Makhmalbaf, a self-taught Iranian filmmaker who has in turn taught all his family members about filmmaking). The film has three episodes focusing on three female characters at points in their lives when they and the world’s attitudes towards them changes. The location is on the island of Kish in the Persian Gulf, just off the Iranian coast. In the first episode a young girl is separated from her childhood friend, a boy, because it is the ‘day she must become a woman’ and be separated from men. In the second episode a young wife seeks her independence by taking part in a bicycle race as an act of defiance against the men of her husband’s family. In the final episode, an old woman is bemused by the ‘consumer experience’ of shopping in the modern store by Kish International Airport. Each story has an element of surrealism or possibly ‘magic realism’. Marziyeh’s stepdaughter Samira Makhmalbaf is actually the more experienced filmmaker, having won a prize at Cannes as an 18 year-old. Her film At Five in the Afternoon (Iran/France 2003, Cert PG) is a very sophisticated film which takes its title from a poem by Lorca and which focuses on the possibility of democracy in Afghanistan. Samira and her father have made three films about Afghanistan (one of the countries which borders Iran). At Five in the Afternoon is perhaps a less accessible film than The Day I Became a Woman, but it could be used to raise issues about a place in the news – presenting the country in a very different way to American or European news stories.